The RAC has said that Britain is being plagued by a generation of 'game boy racers' who drive recklessly after play driving games on their games consoles or PCs. The warning follows the results of a nationwide BSM survey which showed that 34% of young male and female drivers are more likely to drive faster after a short games session, while 27% of young drivers also admitted taking greater risks. The survey of 16-24 year olds also showed that 22% of young drivers also imagine they are actually playing a racing game as they hare around the streets. However it's not all bad news. 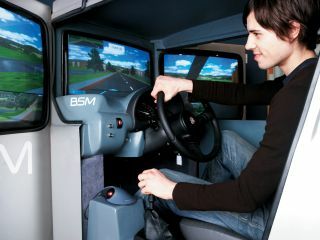 BSM reckons that accredited driving simulators can actually help people to improve their driving skills. Robin Cummins, BSM's road safety consultant, said: "Accredited driving simulators can be a really useful tool in enhancing driving skills such as observation, confidence and reaction times. And in the case of our simulators, they offer a safe environment for young people to try their hand at driving before they're 17." The survey also discovered that frequent gamers are more likely to pass their driving tests first time than their non-game playing rivals; and that 40% of young believe that their reflex reaction are improved after playing driving games.